If you're getting married, the stress of planning a wedding might leave you dreaming of a supremely relaxing honeymoon. However, that romantic getaway can add thousands to your total wedding costs. According to WeddingWire's 2018 report on newlyweds, the average honeymoon costs $4,000. That number is on top of the $27,000 couples spend on the actual wedding ceremony and reception, on average. Rather than buying household items for you, your wedding guests can contribute toward your honeymoon through an online honeymoon registry. Many friends and family members would be happy to help you have a perfect vacation instead of buying a boring toaster or dish set. Here's how to set one up. Sure, you can tell your wedding guests that you'd prefer to receive gifts of cash to put toward your honeymoon, but you might feel uncomfortable doing so. 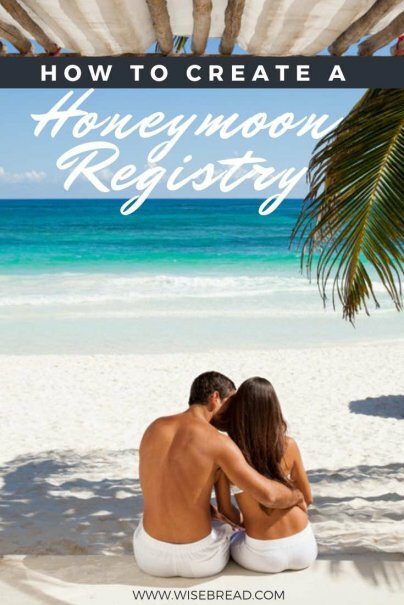 Setting up a honeymoon registry online can make it less awkward and streamline the process for you. Honeyfund, which was featured on Shark Tank, has a free version you can use to collect donations. Through the site, you can create a wishlist, list gift cards you'd like to receive, and even create a wedding website for guests. There are no fees to guests and no fees for withdrawals. However, if you want to get paid via PayPal or WePay, a fee of 2.8% and $.30 per transaction will be withheld. Honeymoon Wishes can help cash donations feel more like an actual gift. Unlike other sites, which usually just issue a check for the full donated amount, Honeymoon Wishes uses the donations to pay the hotel or vendor directly for you. Zola is a comprehensive registry, allowing you to fundraise for your honeymoon and register for specific items, too. You can also create a wedding website with Zola, customize to-do lists to help you during the planning process, and manage your guest list and RSVPs all in one place. When creating your registry, don't overlook common travel expenses. Many people only list the more glamorous aspects, like excursions or hotel stays, and forget about the other expenses that come with a honeymoon. By including those costs, you might not have to spend so much of your own money. Some costs you should include are checked baggage fees, rental car costs, airport parking rates, and boarding for pets. Your wedding guests likely want to give you a gift, but their budgets might be tight, too. It's a good idea to list extras at more affordable price points, or to allow people to pay for only a portion of a more expensive activity so that people can afford to give what they can. Consider including smaller expenses like a bottle of champagne at dinner or a special dessert.